Improvisation Blog: "In light of recent press coverage, the extermination committee is comfortable that procedures have been followed"
"In light of recent press coverage, the extermination committee is comfortable that procedures have been followed"
David Graeber is on a roll at the moment. His latest book "The Utopia of Rules: On technology, Stupidity, and the Secret Joys of Bureaucracy" is a romp through the mad world of systems and procedures which have become so everyday we have almost forgotten they are there. On his way through the mindless madness, his argument takes in Werewolves, Vampires, Batman, Sherlock Holmes and Structuralism making a case for bureaucracy underpinned by 'structural violence'. Of course, Universities (of which Graeber, that leading Occupy activist, is now a firm establishment pillar - weird!) are shining examples of insane and sometimes cruel bureaucracy. Given their social mission (which is of course contested), bureaucracy in the University leads to procedures being "correctly followed" which lead to the abandonment of hope, knowledge, and excuses human cruelty in the name of "academic quality", "maintaining the student experience" or "upholding the institution's reputation". Bureaucracy produces the hollow men and women with empty chests who simply do not acquire the courage to be completely human, stand up for justice and equity, and who ultimately lead the world to catastrophe. It was Hannah Arendt, whose analysis of the arch-bureaucrat Adolph Eichmann, who most clearly saw the crippling disease at the heart of modern society. There are too many Eichmanns around being "comfortable that procedures have been followed. ", and never once questioning what "comfortable" actually means, or what the real consequences of their procedures are. In Eichmann's case, the consequences of the policies were clearly violent. Graeber argues that at the root of all bureaucracy is structural violence. To be "comfortable" with this means, at one level, "we won't get sued". That means "there is no level of bureaucratic violence which can be used against me in my playing my part in this bureaucracy". Eichman's bureaucratic straightness was a self-interested desire not to get into trouble. Arendt believed Eichmann should be hanged for the example of cowardice that he showed in failing to realise his responsibilities as a member of the human race. Arendt didn't have a lot of time for University bureaucrats either, and she may well have had them in mind too in making her pronouncement! 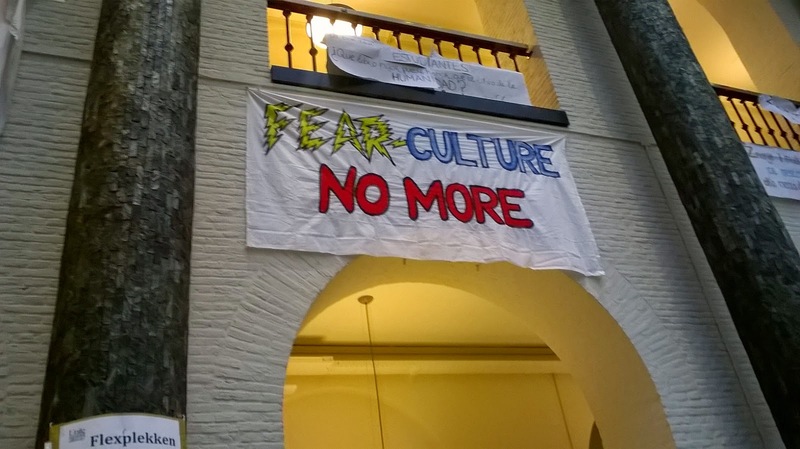 "When I came to University [the University of Amsterdam] I expected University to be different from school. 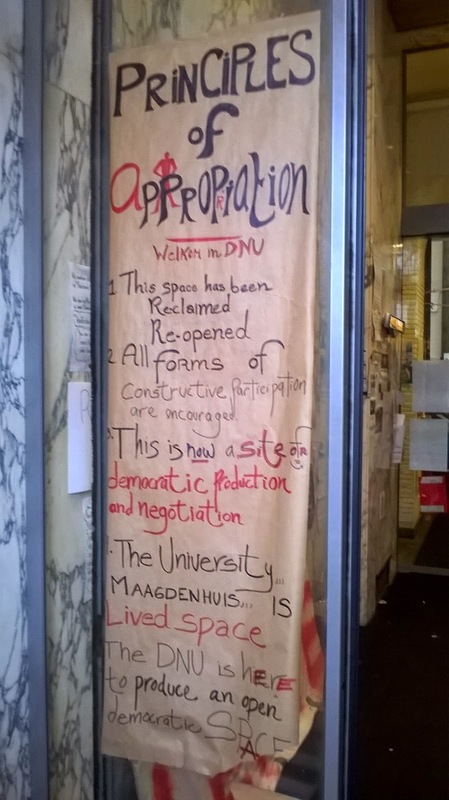 But it was exactly the same - just slightly more difficult"
The Maagdenhuis occupation has created "The New University" (http://newuni.nl) which is causing quite a stir in the press (see http://www.theguardian.com/higher-education-network/2015/mar/17/dutch-student-protests-ignite-movement-against-management-of-universities?CMP=share_btn_tw). This protest is not a vague anti-capitalist objection (although there of course is an underpinning critique of capitalism). There is a specific objection to managerialism: an objection to "target" cultures, measurable learning outcomes, endless surveys, academic disappearances, restructurings, and piles of money on the top floor. Fundamentally it is an objection to the erosion of hope in the university. It strikes me that what is really important about violence is that it is perhaps the only form of human action that holds out even the possibility of having social effects without being communicative. To be more precise: violence may well be the only way it is possible for one human being to do something which will have relatively predictable effects on actions of a person about whom they understand nothing. In pretty much any other way in which you might try to influence another’s actions, you must at least have some idea about who you think they are, who they think you are, what they might want out of the situation, their aversions and proclivities, and so forth. Hit them over the head hard enough, and all of this becomes irrelevant. In contemporary industrialized democracies, the legitimate administration of violence is turned over to what is euphemistically referred to as “criminal law enforcement” – particularly, to police officers. I say “euphemistically” because generations of police sociologists have pointed out that only a very small proportion of what police actually do has anything to do with enforcing criminal law – or with criminal matters of any kind. Most of it has to do with regulations, or, to put it slightly more technically, with the scientific application of physical force, or the threat of physical force, to aid in the resolution of administrative problems. [...] So: Police are bureaucrats with weapons. Structural violence creates lopsided structures of the imagination. Those on the bottom of the heap have to spend a great deal of imaginative energy trying to understand the social dynamics that surround them – including having to imagine the perspectives of those on top – while the latter can wander about largely oblivious to much of what is going on around them. This is, the powerless not only end up doing most of the actual physical labour required to keep society running, they also do most of the interpretive labour as well. Managers make the rules by which everyone else has to abide. University "restructuring" often results in academics writing documents pleading with University management that they shouldn't lose their jobs. This is imaginative labour where the academic has to guess what is in the head of the powerful. The powerful don't care what is in the heads of the academics, because they can get rid of them whatever happens. Rules bring with them implicit or direct threats, loss of one's job being perhaps the most dangerous to the individual, which of course brings other bureaucratic societal threats such as the loss of one's house, danger to one's children and loved ones, and so on. In a bureaucratic society all of this is entirely legitimate. There is no threat to those whose rules threaten others. Those who are subject to the bureaucracy have to second guess the will of the bureaucrats - the burden falls on them to do the imaginative labour. By understanding its connection to structural violence, the cruelty of managerialism becomes more explicit. In Martin Parker's book, "Against Management", he argues that "almost all [...] senses of management are both limiting and dangerous, and that managerialism is ultimately a form of thought and activity which is being used to justify considerable cruelty and inequality." Parker himself has experienced this in the University at first hand in the madness of the business school at Warwick University. Having the courage to speak out about it (albeit changing the institution to the "Euro Business School" - see http://org.sagepub.com/content/21/2/281.short?rss=1&ssource=mfr) is perhaps the first step to doing something constructive about it. However, at the root of it all, there are difficult questions: Why is it that academics ceded control of the Academy? And how do we get it back? Foucault also made this connection between rules and violence in Discipline and Punish - which charted the creation of structures of surveillance to replace the physical power of the king's violence. I'm also kind of curious about the practice of managers appropriating academia - for example where University managers go around awarding themselves - or forcing compliant academics to award them - honorary Doctorates and Professorships. I guess - again quoting Foucault - "knowledge is power" works in the same sense as "might equals right"